We get this complaint mostly from new heat pump owners at the beginning of each heating season. Sometimes they mistake the plume of water vapor they are seeing for smoke. Some even thinking their outdoor fan motor burned-up, because when this is happening the fan actually stops running even though the compressor continues running, sometimes making a louder than normal sound. But don't worry, this is a good thing! This is actually just your heat pump during the "Defrost Mode". It happens regularly during the heating season. The outdoor coils tend to frost or ice-up during the winter - especially in moist conditions, causing the unit to loose efficiency. 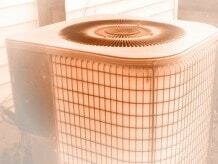 By regularly defrosting itself; keeping the outdoor coil clear for proper airflow, the heat pump runs more efficiently. When the unit does go into the defrost mode, a couple of things happen. First, the outdoor fan motor stops running. This helps build-up more pressure and heat to melt the ice. Also the reversing valve shifts from the heating mode to the air conditioning mode. That's right, you are actually running the air conditioner. By making the outdoor unit the condenser, the warm refrigerant gas passing through the coils accomplishes the defrosting. Lastly, the supplemental heat at the indoor unit is energized to offset the now, cold air blowing in the house. Yes, it does sound a little bizarre to run the air conditioning and back-up heat at the same time during the winter. But it usually only happens for a few minutes at a time, and only as needed. Now, your heat pump should only go into the defrost mode periodically, except for severe weather conditions (snow, rain, sleet). If your unit is constantly going into defrost, this may indicate a problem.